i was looking at their banks too. I don't think anyone on here has picked one up, or if they have, they didn't mention it. Wonder how the banks will do if someone needed a jump? I thought there was another thread or two, but I couldn't find it. This is not your exact application but it can give you an idea of performance of you haven't already seen this. I think with a solid agm up front and that sb500 you should be solid at 2k. But that is just a guess honestly. I have no experience with them. Keep in mind your PCM controlled alt will stop charging occasionally so your cap bank will discharge just like a battery will. If you dont mind having the battery-light on, then you can get a 'single wire' regulator on your alt so that you charge at 14.2-15V (depending on temperature) all the time. Or you can unplug your battery current sensor and charge at 13.8V all the time. You wont get a battery light in this case. I would add battery if you leave your alt alone, but thats just my opinion from my experience dealing with a PCM controlled alt with (2) AA5Ks at 0.35ohm. Having a battery light on will irritate me bad..im curious on this unplug sensor though i could live with 13.8 ..? My question i guess would a single sb500 be better then a single agm xs agm under the hood.? If go by watts the 500 is rated 4000 and xs agm is 2 or 3000? Contemplating picking one of these up myself when the tax return comes in. Probably go for the 47 myself and save some space. 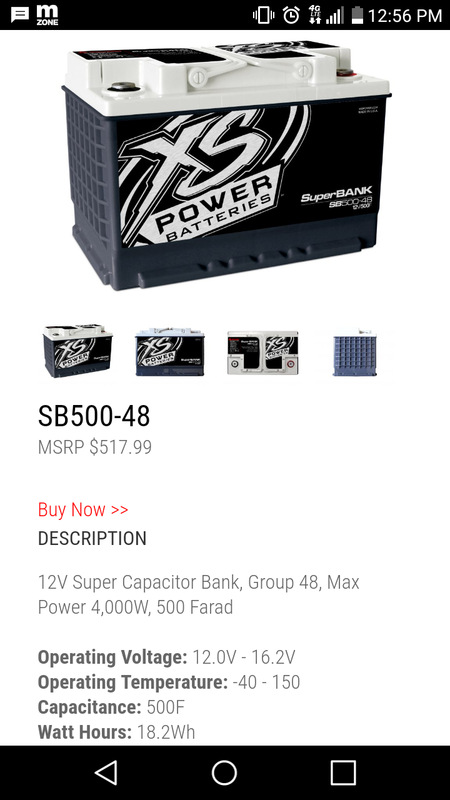 With a 4000w max rating on the 500F a person would probably want to half that for rms power right? I have a system total of 2400w rated rms stepping up to something in the 1000F series would probably be unnecessary ? My only reason for considering the 1000F is i could probably ditch the two group 65 AGM's in the bed of my truck and save about 100lbs of weight.